ArenaNet did a few things differently this time around with the press preview for the upcoming Queen’s Jubilee. Instead of being granted full access, which allows some to write full guides and spoilers, ArenaNet prepared a private Twitch stream. The main reason seems to be that this next update is chock full of story happenings, and the team did not want anything spoiled. So my first impressions are going to be narrower than previous ones. Anyway, the human queen decided that a hole in her capital city was not a good symbol of human resilience and triumph, and so she decided to make it in to a fierce battleground, the Crown Pavilion. The Crown Pavilion is a new sub-zone in Divinity’s Reach split up in to a 6-piece pie shape. All around the Pavilion are the mechanical representations of humanity’s enemies (the new Watchknights with a layer of mesmer magic). 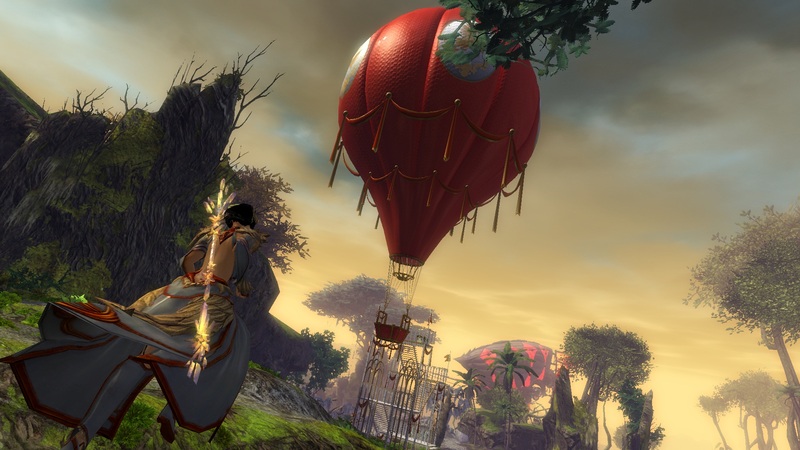 Getting to the Pavilion is incredibly easy since there are hot air balloon towers all around Tyria that will warp players for free to the Crown Pavilion. It’s hard not to be attracted to these structures dominating the skylines, and it was the team’s goal to attract notice to the centerpiece of this update in a more organic way instead of relying on mail and Heralds as much. The hot air balloon towers will be found in every zone except Orr and Southsun. The centerpiece of the update is to focus players to the Crown Pavilion, persistently. Seeing it reminded me of how the community came together for The Secret of Southsun to spectacularly farm the whole island. Except this time things are going to be significantly tougher because zerg breaking was kept in mind the whole time for design. Coupled with buffs received from the various racial (city) representatives (again similar to the buffs in Secret of Southsun), I think the Crown Pavilion is going to convey similar energy. One interesting mechanic added is that for each piece of the pie that is not conquered, all players in the Pavilion will have a small debuff. So even if a certain piece of the pie is relatively easy to conquer, it’s best to rotate around. Players not as interested in joining a mass zerg (split as it will be along the pie) can go to the upper balcony area to the Queen’s Gauntlet to fight against a progression of one-on-one PvE fights. The first fight has an easy mechanic: don’t stand in front of the guy’s ground pound, while a later fight might light up the arena with tornadoes flying everywhere. I think this will be a great minigame, and unlike the activities in the Bazaar in the previous month, the Queen’s Gauntlet keeps people in the Crown Pavilion. Players can watch as their friends head in to the Gauntlet to cheer them on, give them tips, and rez and jeer at them when they fail. As I was finishing up some content for Cutthroat Politics, I was a little dismayed that if I wanted to farm, there was no definitive answer this time around for where I would find the community. Cursed Shore had it’s usual, as did the dragon circuit. But, there was nothing coming close to the focal point in some of the updates. I think that this will not be the case. I expect that for the open-world excitement, the Crown Pavilion wll be the default for August. The community is going to be in Divinity’s Reach because that’s where the action and the rewards will be. I’ll be happy to answer any questions below, but keep in mind that my preview was limited to a developer-run stream. and it’s temporary… I’m extremely frustrated at the moment. I thought Colin said that they’re building more permanent stuff from now on… yeah right. Remember that design for this started 4 months ago. I would guess probably in the final months this year you will start seeing better dev feedback to creating permanent additions. …but why not leave these challenges in the game? I don’t get it. Is it impossible to change something like that in the short term? If it follows the pattern of all previous LS updates I’ll have finished all the available Story elements on Tuesday, will spend one or two days knocking out the achievements, possibly needing one weekend day to finish up, after which I’ll forget about the whole thing for the following nine or ten days. Then we start ll over again. I could stretch that out by doing it all again on my second account but that stopped being fun long ago. I think this two-week cycle is the worst of both worlds. I was 100% behind genuine “be there or miss it” dynamic content; stuff that happens once and never again. That’s thrilling to me but apparently it didn’t go down well in general so we aren’t getting it. Neither are we getting much in the way of non-time-limited permanent content that I can do at my leisure. Either of those approaches would work for me. This one is just annoying. Doesn’t matter much to me, though, cos I spend most of my GW2 time in WvW right now. Some recent dev comments, for me, shed light on what happened: the first big update was the Halloween update, and it included a bunch of new dynamic events that could be done at one’s leisure: the skritt thief and the Modus Sceleris. No-one cared. For months. What people cared about, what people remembered, was all the time-limited stuff, that drove people to the same place and had them all interacting together. What ArenaNet took from that, and from what’s happened since: big showy events are better than subtle updates, and time-limited events drive player behaviour more reliably than rewards (and basically take no effort to balance, either). I think this ‘temporary content’ issue is really going to come to a head with this patch for many players. By the sounds of it, it will be a great challenging solo/communal activity and a spotlight on DR, and then to lock the pavilion up again after a month, appears to be a ridiculous decision to me. Even if it was to return, having that limited time-frame is going to be disruptive to players progression in the queen’s gauntlet, an activity that could keep players coming back to it for months until they eventually killed the final boss. I’m desperately trying to bite down on the immediate panic impulse on hearing that a) tickets will be needed to access the Queen’s Gauntlet and b) there are only 6 ‘rooms’ per map to fight the bosses for 2 mins each go. I’m envisioning this nightmare scenario of being “forced” to group zerg and farm up tickets, in order to stand in massive queues and wait for a short turn at a boss, where it is very possible to fail. The iteration time sounds like it’s going to be punishing, rather than fun to learn the fights. And oh, let us not forget, hard-to-earn achievements for time-limited content that will last only a month at best, and two weeks at worst. Nothing to do but try to calm down and wait and see, I guess. I guess I’m one of the few people who enjoys the two week pacing of these releases. As a working adult, the most I can hope to spend a day is two hours after work, maybe a bit more on the weekend–all this assuming I don’t have things like family issues, overtime/weekend work, or other commitments. This schedule gave me (barely!) enough time to finish all achieves in the Bazaar content across four weeks, and (again, barely!) enough time to finish the Kiel/Gnashblade metas (but not all the achieves) across two weeks. Even those with slightly less time would probably have been able to complete at least both metas if they planned their play time accordingly. ANet has hit the sweet spot for those like me to complete the metas–the “important” part of the content–and see most of what they have on offer right before the next batch is released. I imagine that those able to spend 8-9 hours a day playing–as I once used to be able to do–would be able to blow through the content in just a couple days of playing. To those people, I say: you’re never going to see the volume of content per unit time that you’re hoping for, so take some time to savor the content rather than race to finish it. Think back to the Flame and Frost storyline, when we got essentially one new gimmick a month for four (five?) months–remember the first month, when all we had was repairing signposts, which took even me less than 2 hours to finish? Yeah, we’ve come a long way since half a year ago. In short, if you feel you are completing the content really quickly, just try to take your time a little bit more. Everytime i read this “but it is temporally”, I remember that sandobox MMO only have temporally content.